Many business families consider the family office to be an essential vehicle for family success and wealth regeneration. The family office has a unique position within the family enterprise, and when run effectively, it can sustain a family’s passion for staying together, building wealth, and creating value for society. Regrettably, many family offices perform sub-optimally and do not become enduring multigenerational institutions. To have a high performing family office, a family needs to set it up right, ensure solid governance and leadership, measure its performance, adjust it as the family’s needs change, and guide it wisely. The Family Office Compass is the perfect tool to help business families set up or formalize a dedicated single family office that is right for them. Based on extensive global experience in researching and advising family offices, the Family Office Compass combines both family strategy and wealth management expertise. 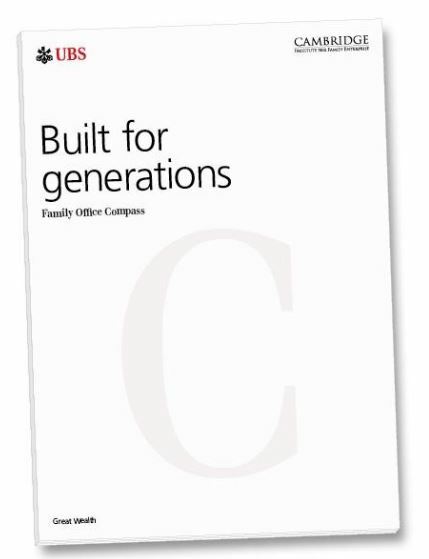 It leads readers through a structured and proven process for architecting, setting up and running a family office. You can use this Compass as a field guide to ask key questions about family offices, identify your family’s unique needs, and then use it to design, set up, and run a family office to meet those needs. The book provides concrete recommendations and examples from leading single-family offices around the world. For wealthy families driven to accomplish extraordinary things, an effective family office really helps move the needle. When you combine the family’s clarity of purpose with the family office’s professional resources and ability to execute well, you create a formula for success. The book is available in hard copy. To receive a complimentary copy, contact us. To interview the research team about this study, contact us.